Keonna, 33, knows what she needs to do to be successful at her job as a Goodwill donation attendant. The 17th and Yale Avenue attended donation center in Tulsa, where Keonna has worked for nine years, is a busy site. They can serve up to 100 people a day, Keonna said, so she has to be on point – and on time. Getting to work by 9 a.m. (10 a.m. on Saturdays) could be a challenge as Keonna does not have a car and has to use public transportation. No problem. Keonna has figured out her commute, which now involves two bus trips and a short walk to the site. She has to allow for a good two and a half hours to make sure she is on time. She knows the Tulsa Transit system so well that she can map out a trip itinerary for others off the top of her head. Keonna has met the transportation challenge head on. She approaches her disability in the same way. Keonna believes that her diagnosis does not define her. She carries herself such that you probably would not even notice a disability. “She’s a leader,” said Goodwill Job Share Program Manager Rhonda Hall. If something needs to be done, Keonna will do it. And if a change is needed to make things run smoother at the donation center, Keonna will look to implement it. She demonstrates great customer service to her co-workers, who look to her for encouragement and her job knowledge. 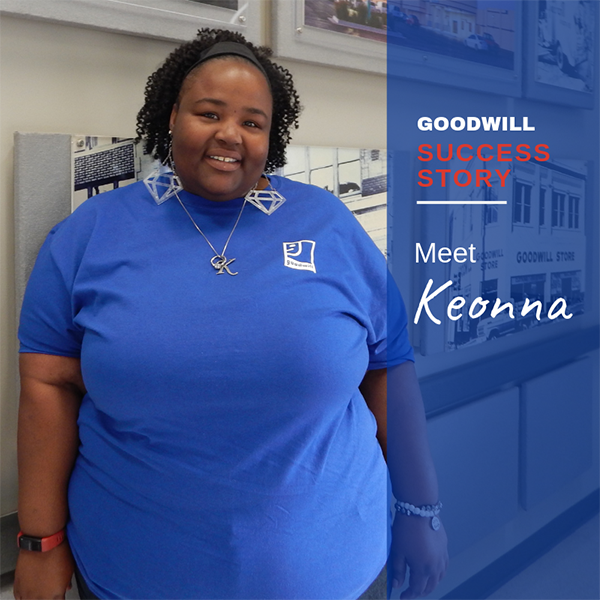 Keonna’s dedication has been evident since she came to Goodwill out of high school in 2004. She was a contract service worker at the former Goodwill East Campus in Tulsa, where she did packaging and light-assembly work for companies. Her supervisor believed she could handle more challenging work (“I was fast at it!” Keonna added), so Keonna applied for and got the donation attendant position. Rhonda helped Keonna overcome her shyness on the job and to learn to keep her spirits up at work. “Just because you had a bad day you can’t take it out on the customers,” Keonna said. Even when there are multiple cars waiting to unload and many full carts to sort, she said she does not let it overwhelm her. The work is fun and it keeps her busy. Job coach Jeanette and her coworkers feel like “family.” She enjoys interacting with donors, meeting new people and seeing the interesting things they bring. “Are you sure you don’t want a tax receipt, this is pretty nice stuff?” Keonna often asks. Having a good job also helps Keonna maintain order in her personal life. And she sees her personal growth from someone who could be “a handful” to a mature young woman who can be serious about work and still find joy in it. At work and at home, Keonna keeps herself busy. She takes walks in her spare time; she has a goal of 8,000 steps per day, around 3,000 of which she gets during her commute to work, another benefit of the job. Sometimes, when she gets home after a day of work, it can still be hard to shut it down, Keonna admitted. “I want an extra day,” she said with a laugh.